In his latest book, Adults in the Room (see here for a review in The Guardian), Yanis Varoufakis gives us his version of the events that led to the Tsipras government’s shameful capitulation in July 2015. It essentially analyses the period 2009-2015, though it makes incursions into earlier periods. From the author’s demonstration, we can clearly see that his behaviour and the politico-economic orientation he defended contributed to the disaster. 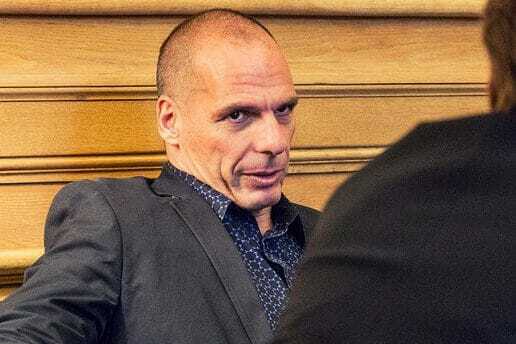 Yanis Varoufakis clearly claims to have played a major role in working out the strategy adopted by a handful of Syriza leaders—Alexis Tsipras, Yanis Dragasakis, and Nikkos Pappas, essentially — before their victory in the January 2015 election. Varoufakis does not plead guilty. He is convinced that had Tsipras actually taken the orientation he proposed and which Tsipras had agreed to late in 2014, the result would not have been defeat for the Greek people. But, contrary to the conviction Varoufakis expresses, an attentive reading of his book leads to the conclusion that he contributed to that defeat. Varoufakis explains how he gradually convinced Tsipras, Pappas, and Dragasakis not to follow the orientation adopted by Syriza in 2012, then in 2014. He explains that along with them, he worked out a new orientation that was not discussed within Syriza and was different from the one Syriza ran on during the January 2015 campaign. And that orientation was to lead, at best, to failure, and at worst to capitulation. Varoufakis sums up six priority measures he proposed to Tsipras, Dragasakis, and Pappas and to which they agreed. What these measures implied was that Greece would remain in the Eurozone. Second, a primary surplus of no more than 1.5 per cent of national income and no new austerity measures. Third, wide-ranging reductions in sales and business tax rates. Fourth, strategic privatizations under conditions that preserve labour rights and boost investment. Fifth, the creation of a development bank that would use remaining public assets as collateral to generate a domestic investment drive, and whose dividends would be channelled into public pension funds. Back in Austin, I heard on the news that Alexis had delivered a major speech in Thessaloniki outlining Syriza’s economic platform. Gobsmacked, I got hold of the text and read it. A wave of nausea and indignation permeated my gut. Straight away I went to work. The article that emerged less than half an hour later was used soon after its publication by Prime Minister Samaras to lambast Syriza in parliament: ‘Even Varoufakis, your economic guru, says that your promises are fake.’ And so they were. Taking Winston Churchill as a positive reference in a public criticism of the Thessaloniki Programme took some doing. It was Churchill who organized the bloody repression of the demonstrations and strikes that shook Greece in late 1944 when, under the Yalta agreements, Britain took control of the country by repressing the very forces that had freed the country from the Nazi occupation. Let us examine the measures as Varoufakis outlines them. Varoufakis proposes restructuring the debt without reducing the debt stock. This first, very moderate measure depended on the good will of the Troika. In fact it was mere wishful thinking. Without recourse to a suspension of payment, combined with other unilateral acts including conducting an audit of the debt (with citizen participation), it was impossible to force the creditors to accept a real radical reduction of the debt. Varoufakis’s main proposal regarding restructuring the debt, as he says himself, is in line with his “Modest Proposal for Resolving the Euro Crisis.” Putting that proposal, which consisted in mutualising the public debts of the Eurozone, into practice would have required a joint decision by the governments of the Zone to ease public finances and abandon austerity policies. This is technically possible, and is politically desirable from the point of view of boosting the economy and creating a new neo-Keynesian social contract. But despite the moderate nature of the proposal, it is totally incompatible with the policies of the majority of the governments concerned. One would have to be extremely naive to think that the government leaders in place in most European capitals could be favourable to a Keynesian stimulus. Basing a solution on such a hypothesis shows a total lack of awareness of the power balance and the motivations of European policymakers. Comment: These two proposals were just as unfeasible politically as was the idea of mutualising debt. Moreover, Varoufakis’s entire proposal regarding debt was and is unacceptable from a left-wing point of view because it presupposes evacuating any debate as to the legality and legitimacy of the debts whose repayment is being demanded of Greece. Varoufakis’s proposal is in direct opposition to the position adopted by Syriza in 2012, which was to unilaterally suspend repayment and conduct an audit of the debt (I will return to this point later). Further — and this is important — in his proposal Varoufakis does not explicitly include the abandonment of the conditions imposed by the creditors. It is evident that this approach was also explicitly in opposition to a legitimate refusal to continue repayment of an odious debt. Comment: Committing to a primary surplus of 1.5% is totally incompatible with a true policy of stimulation of the economy, public and private employment, and purchasing power for the mass of the population. In Greece, a left-wing government which wishes to actually implement a stimulus policy and respond to a humanitarian crisis must apply a policy of deficit spending over a period of several years and refuse to secure a primary surplus. ’Why should business pay less?’ Alexis protested. I explained that I thought the private sector should pay more in total tax revenue, but the only way to achieve an overall increase in their contribution at a time of next to no sales and with bankrupt banks unable to provide credit even to profitable firms was to reduce the corporate tax rate. Dragasakis stepped in to say he agreed, apparently allaying Alexis and Pappas’s initial consternation. Comment: Promising an undifferentiated reduction in corporate taxes is simply incompatible with a politics of the Left. Tax rates must be increased for large corporations, and the increase enforced. But there is no reason why the tax rates on small companies can’t be lowered at the same time. In any case, the belief that reducing corporate taxes will increase corporations’ contribution to revenues has never been demonstrated, and is more liberal incantation than reasoned argument. When it came to privatizations, I continued, we would have to make compromises if we wanted an agreement with the EU and the IMF. Syriza’s blanket rejection of privatization would have to be replaced with a policy of considering them case by case. Fire sales of public holdings had to end, but there would be some assets, such as ports and railways, that we should make available conditional on a minimum level of investment, on the buyer’s commitment to granting workers proper contracts and the right to union representation, and on the state retaining a large, even if minority, shareholding, the dividends from which would be used to assist pension funds. Comment: Whereas Syriza was fighting to put an end to privatisations and to renationalise a group of companies that had been privatised, Varoufakis — as indeed would be his practice once he became Minister — was favourable to the continuation of certain privatisations. This attitude condemned the government to submission to the major corporations, and in particular to foreign capital. The effect was to reduce the public authorities to impotence. Meanwhile, those assets that were to remain under public ownership should be handed over to a new public development bank, which would use them as collateral in the raising of funds to be invested in these same public assets so as to boost their value, create jobs and enhance future revenues. They agreed on this too. Comment: Varoufakis presents the creation of a public development bank in order to wash down the bitter pill of Proposals 4 and 6, which are in total contradiction with a left-wing strategy. Measure 4 consists in continuing the privatisations and Measure 6 in relinquishing the power the Greek public authorities still had over the Greek banks. Measure 5 served as a lure to make it appear as though the public authorities were going to set up a true public development instrument. Comment: The Greek state was the principal shareholder of all the Greek banks and Syriza’s position was that the public authorities should actually exercise their power over the banks. In proposing to Tsipras, Pappas, and Dragasakis that the shares owned by the Greek public authorities should be transferred to the EU, Varoufakis was making an additional — and potentially tragic — step towards the complete abandonment of sovereignty. After summing up these six proposals that he claims were accepted by Tsipras-Pappas-Dragasakis, Varoufakis comes to the strategy a Syriza government should bring to bear in negotiating with the EU. He explains that if the EU decided to directly sabotage the government, the ECB would do the dirty work. It would cut off the cash flow to the Greek banks and require them to shut their doors, as was done in March 2013 in Cyprus, according to Varoufakis. Their agreement had to extend also to my proposed negotiating strategy, complete with its key deterrent, the threat to haircut our SMP bonds, and the parallel payments system with which to buy time in the event of an impasse that would bring on bank closures. I will return to this issue of negotiating strategy in a forthcoming article in which I will discuss the period that followed the elections in January 2015. Varoufakis tells us that following the meeting with the Tsipras-Pappas-Dragasakis trio, he accepted the position of Finance Minister. Dragasakis, for his part, would occupy the post of Deputy Prime Minister and would directly supervise three key ministries, including Finance. ↩ Yanis Varoufakis, Adults in the Room (Verso: Bodley Head, London, 2017,), p. 98. ↩ This citation and all the following ones are from Chapter 4. Click here to read the Greek version of this article. Translated by Snake Arbusto in collaboration with Vicki Briault. 150 years of Das Kapital: How relevant is Marx today?